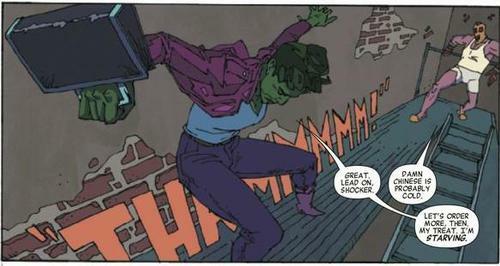 After reading She-Hulk #7, I’m just sitting here having all these feelings. Javier Pulido is back. Am I just supposed to pretend that that whole Ron Wimberly thing never happened? Am I just supposed to be able to snap back to looking at She-Hulk the way I did before? 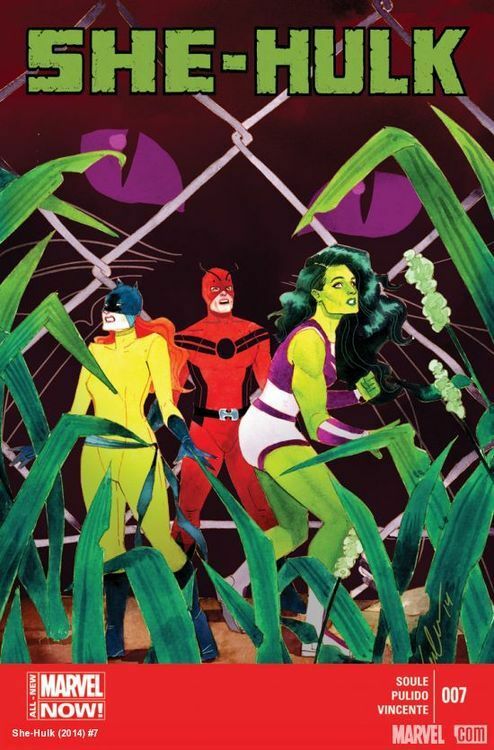 I loved She-Hulk from the beginning, for the silliness and the intensity of the bright Magic Marker colors. I liked how everything was smooth and pulled taut, and imbued with secret meanings. It was all like a code, like the real message was in royal blue against fire engine red, or in a circle placed next to a square. I liked how it was shallow nonsense a lot of the time but had some nice little day-to-day lawyering stuff, and some nods to the importance of friendship, and of course—flashy superhero cameos! So that’s how it started with Soule/Pulido/Vincente. 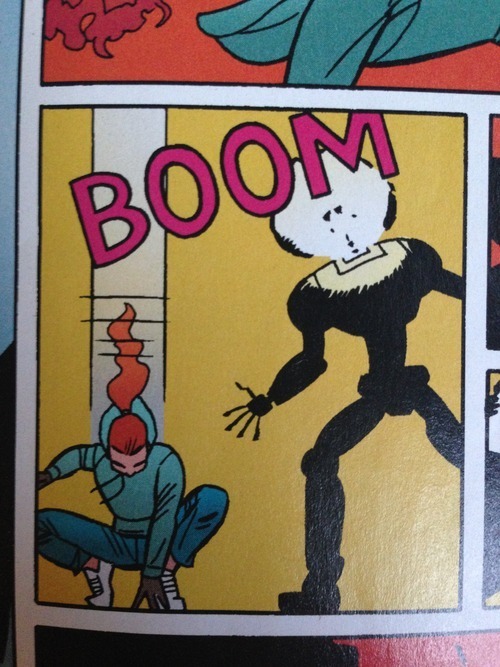 Then with She-Hulk #5, Ron Wimberly and Rico Renzi just blew the top off the whole thing. They kept the color scheme and just crammed this book full of so much energy it couldn’t be contained inside shapes and lines anymore. Crazy angles, jagged lines, everything popping and crackling, and the panels coming unmoored from each other and starting to drift apart, not lined up like little soldiers the way Pulido had them. And Wimberly gave Jennifer Walters more depth and personhood than she before. It made me expect more from the whole story, especially since Charles Soule seemed like he was really getting going with a meaty storyline!! I borrowed a copy of Prince of Cats and pored over it. I eagerly awaited his second guest-artist issue, #6. Then She-Hulk #6 came and it felt like everyone half-assed it — or maybe they tried as hard as they could but circumstances were against them. I don’t want to diss their creative efforts. There were still great moments in both dialogue and picture. 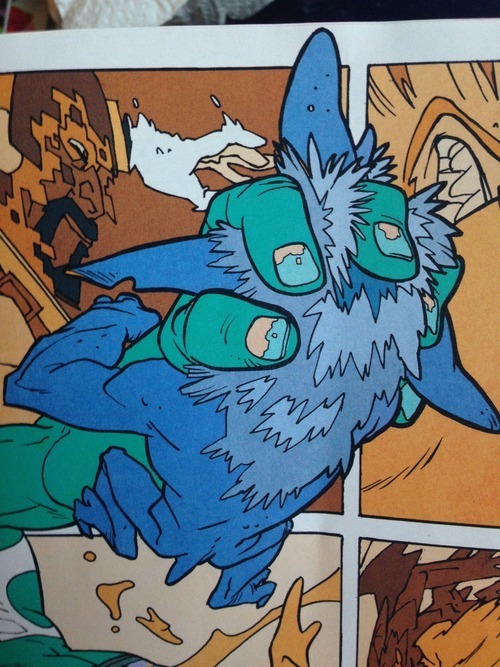 But Renzi the colorist was gone, Soule was off his writing game, and Wimberly seemed to wrap himself protectively around an awesome central fight scene like some kind of sea creature preserving its vital organs by letting its extremities get eaten by predators. My love for Wimberly did not waver despite the disappointment. I eagerly await whatever else of his I can get my hands on in the future. But She-Hulk is different for me now. It’s like Wimberly hulked her up and tattered her clothing to ribbons and now Javier Pulido and Charles Soule have to wear those shreds. And you know they don’t do messy. Javier Pulido’s Jennifer Walters doesn’t get much hulkier than a beach volleyball player, and her kickaround clothes are all synthetic, stretchy loungewear. She can’t be going around in tatters. With her stretch marks showing. With her embarrassing underpants and weak storyline showing. And I pretend it’s enough. For one thing, where the HELL is Angie Huang??? ?